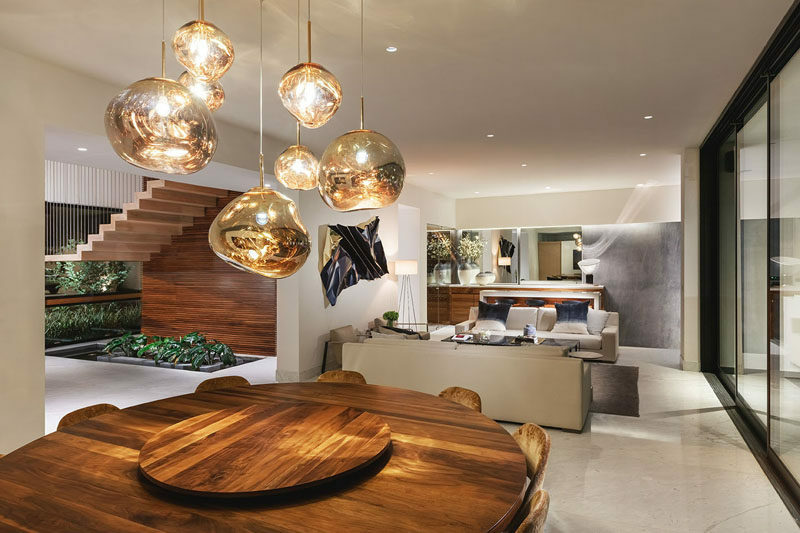 Architecture and interior design firm Azul Celeste, have recently completed the interior design of CASA IC, a modern house for a family in Mexico. 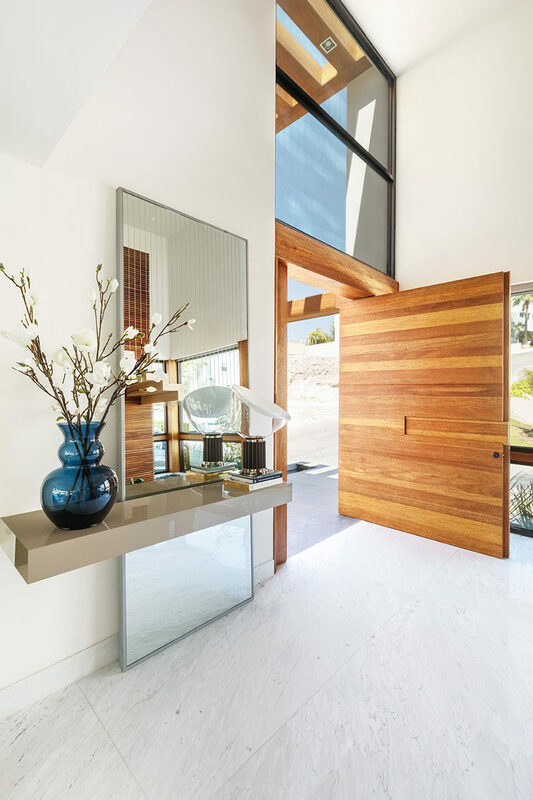 An oversized, pivoting, wood front door welcomes visitors to the home, and it opens up to a large double-height foyer. The foyer leads to the main social areas of the house, like the dining room, living room and bar. 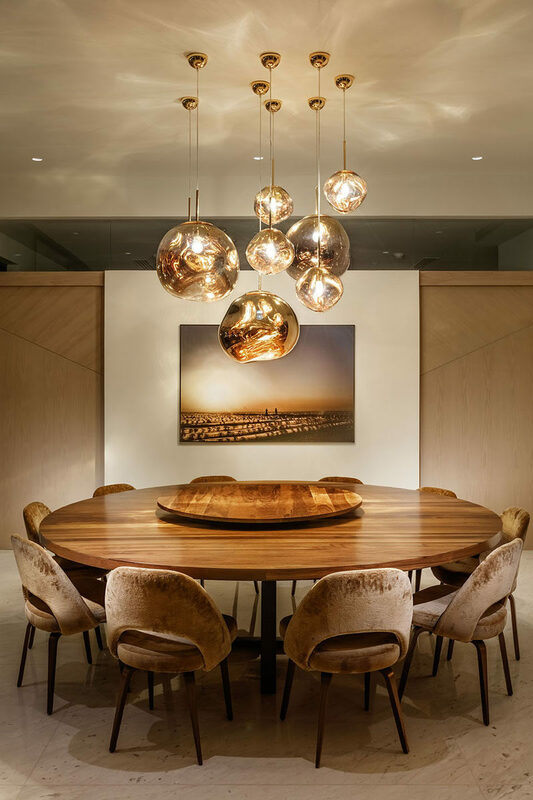 In the dining area, a collection of pendant lights hang above the large and round wood dining table. 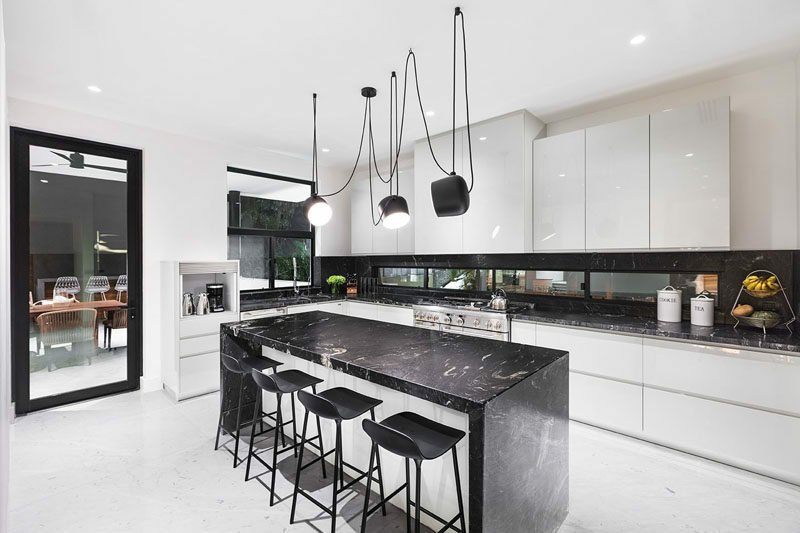 Separated from the dining room by a wall is the kitchen, that’s characterized by its black and white tones. 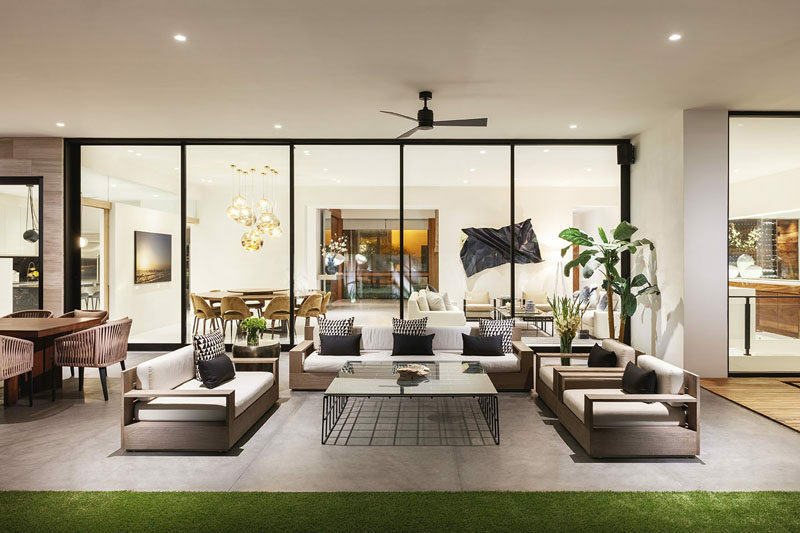 A wall of sliding windows can be opened to join the outdoor covered terrace with the interior spaces, making it a large open space for entertaining. 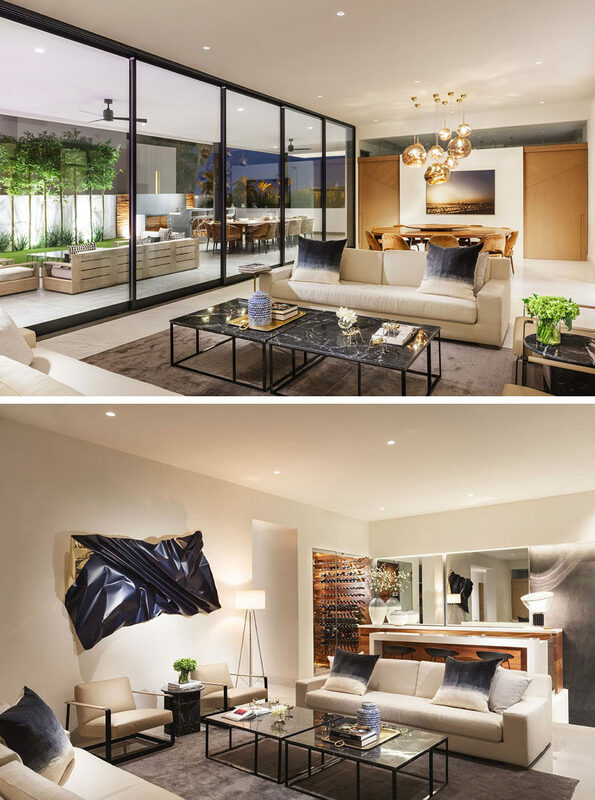 Back inside, the living area is defined by the use of a rug and a sculptural art piece on the wall. Behind the living area is a bar with an island and large mirrors that make the room feel larger. 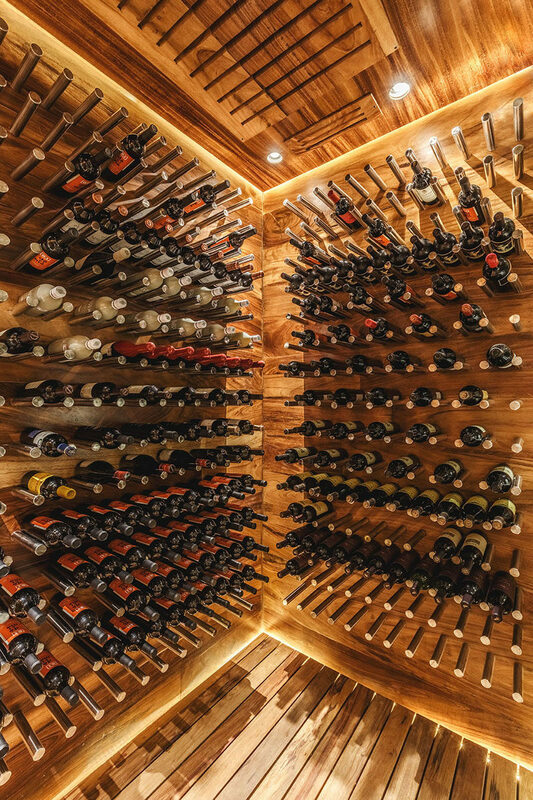 Off to the side of the bar is a wood lined wine cellar. 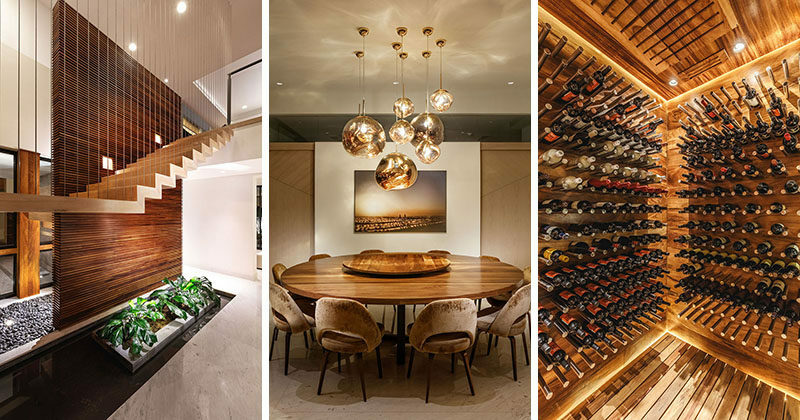 Metal rods have been used to create exposed shelving for the wine, showing off the home owners collection. 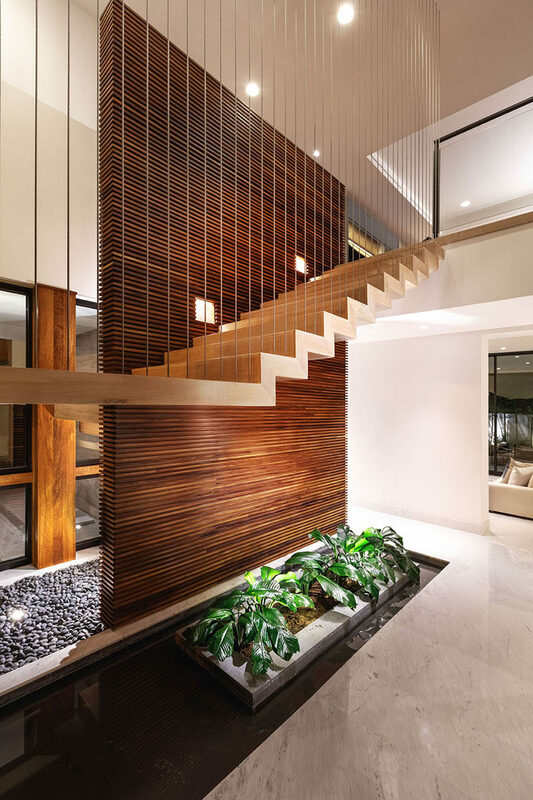 Back in the foyer, there’s a staircase that runs alongside a wood slat wall made from Parota. A touch of nature has been included underneath the stairs in the form of a water feature and planters. 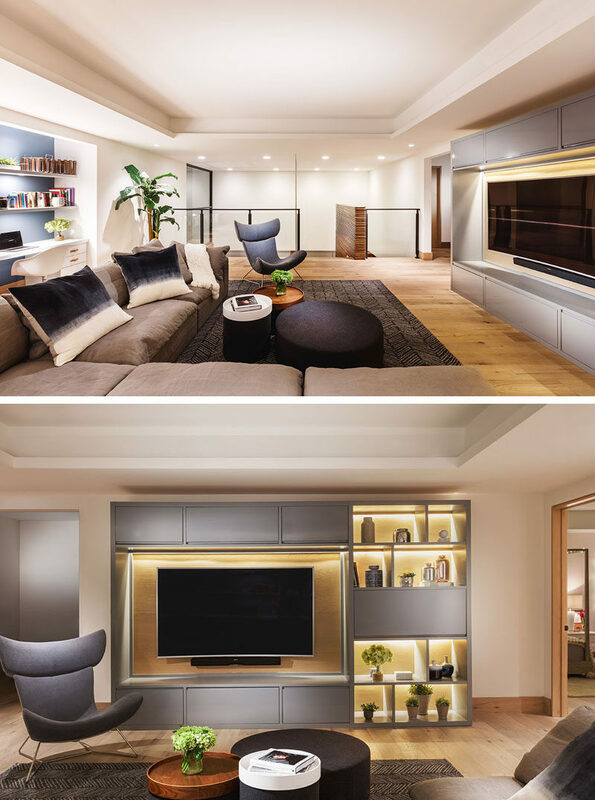 At the top of the stairs, there’s an open room that’s been designated as a relaxing lounge area, with a large couch and grey entertainment unit with backlit shelving. Behind the couch is a homework station or home office area for two people. A blue accent wall helps to make the white shelving stand out. 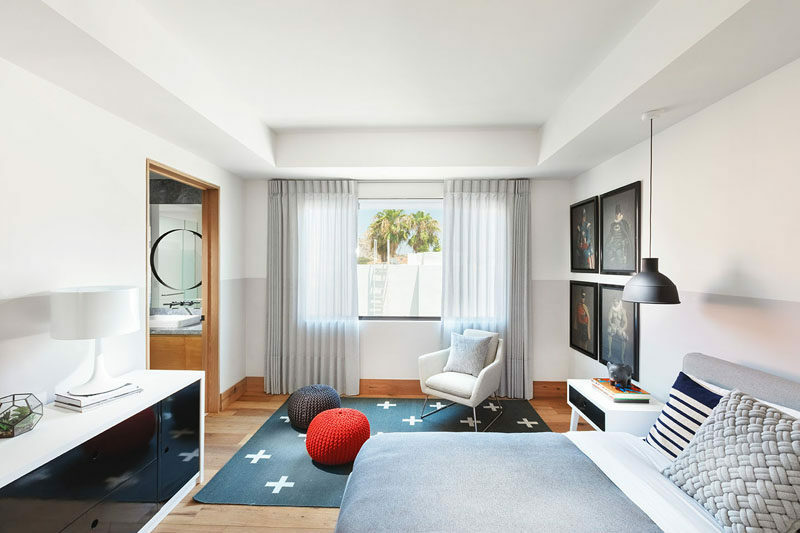 The bedrooms of the home are located off the open living room, and in this bedroom, there’s enough room to have a reading area with a rug and a chair. 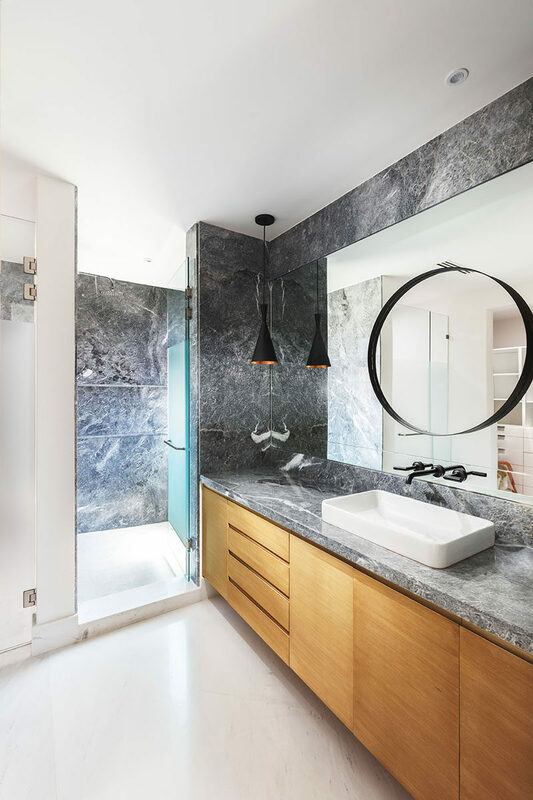 In the ensuite bathroom, grey stone covers the walls and is used for the counter on top of the light wood vanity. 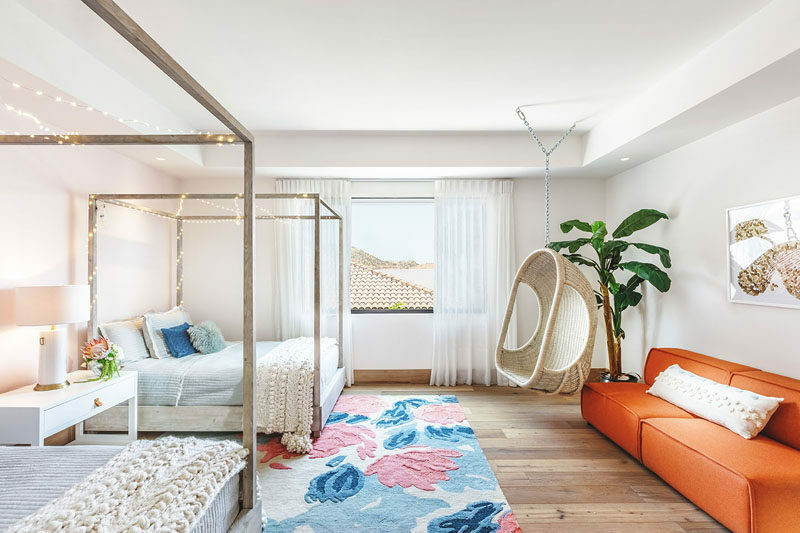 In another bedroom, there’s two beds decorated with fairy lights, and on the opposite wall there’s a bright orange couch, and a woven chair hangs from the ceiling. 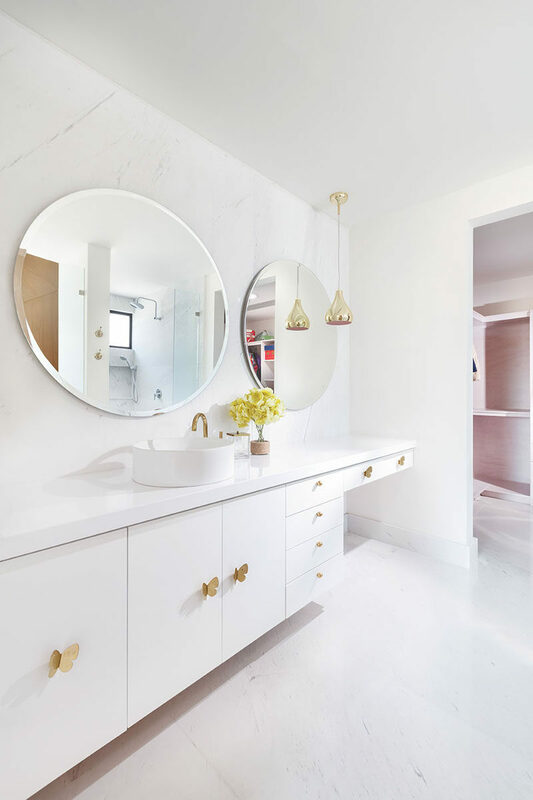 This bedroom also has an ensuite bathroom, however this one has been kept bright and white, complementing the bedroom design. 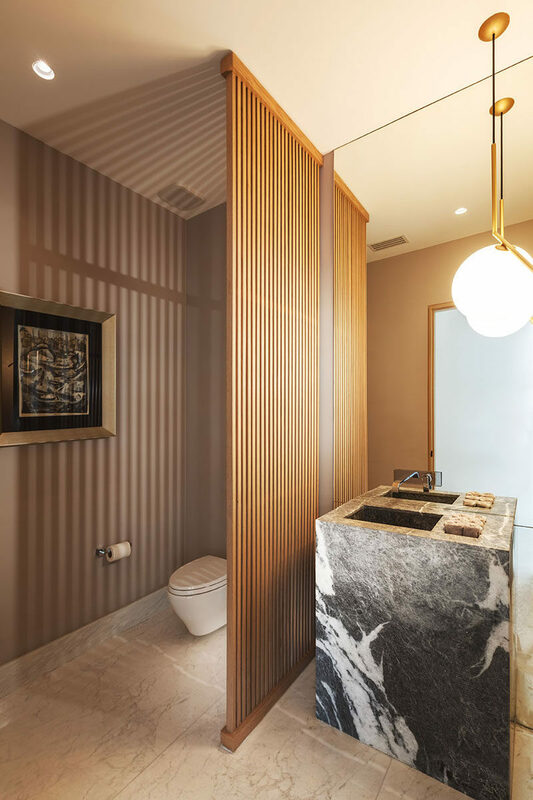 In a powder room, a wood slat wall separates the vanity area from the toilet, without blocking the light from the pendant light. 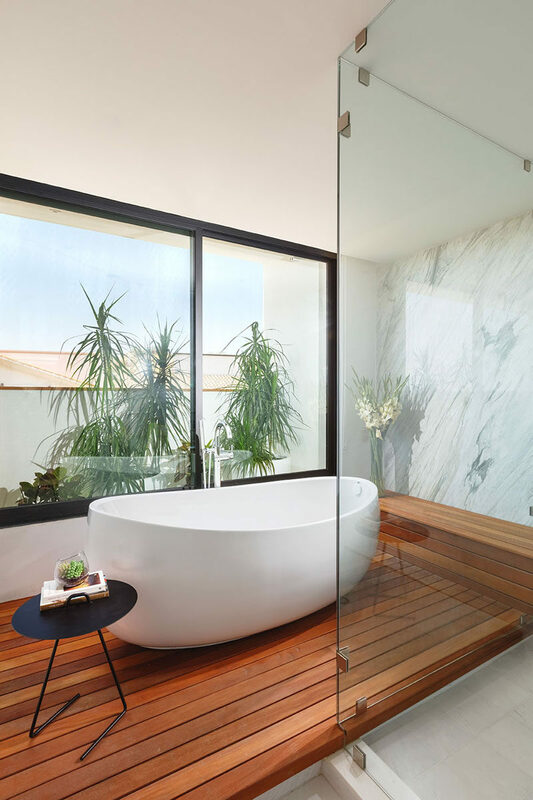 In another bathroom, a freestanding white bathtub is positioned in front of the window on a raised wood platform.